After several months of translation work the Spanish language version of PV-DesignPro is complete thanks to the European Community solar orgranization known as Censolar. Also, Censolar is considering the possibility of revising some of their training materials to incorporate system design using PV-DesignPro S, G, and P versions. Censolar is the exclusive distributor of the PV-DesignPro Spanish language version, which is available for purchase from them by contacting censolar@censolar.org. Beginning in March 1999, MSESC has been in partnership with researchers at Sandia National Labs Photovoltaic Systems Department to include the Sandia Model of Photovoltaic Performance in PV-DesignPro. This has resulted in the first commercially available software to include this revolutionary new model of PV performance. The Sandia Photovoltaic Model has evolved since 1976 as a result of experience gained during thousands of outdoor performance measurements on photovoltaic modules and arrays conducted by Sandia National Laboratories. Starting in 1991, a concerted outdoor module testing effort was established aimed at understanding and quantifying the interacting environmental influences that affect the performance of commercial photovoltaic modules. This effort led to the initial form of the Sandia performance model, which was first publicly presented at an NREL Performance and Reliability Workshop at the National Renewable Energy Laboratory in 1994, with an updated form presented at the NREL/SNL Program Review Meeting in 1996. From 1991 to 1999, the modeling approach has been validated using thousands of outdoor performance measurements on a wide variety of commercially available photovoltaic technologies. Module technologies to which the methodology has been applied include: crystalline silicon, multicrystalline silicon, silicon-film, amorphous silicon, cadmium telluride, copper indium diselenide, and concentrator silicon modules. Beginning in September 1995, the same outdoor testing procedures and modeling methodology was applied in the field to a variety of large photovoltaic arrays. From 1995 to 1999, the performance model was successfully applied to about a dozen photovoltaic arrays of different technologies, comprising over 1 MW of capacity. 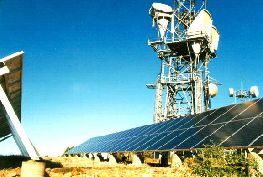 In 1998, the performance model was incorporated in a prototype software program at Sandia for conducting annual energy calculations for PV systems using Typical Meteorological Year (TMY) hourly environmental conditions as input. Also in 1998, the performance model was adopted by the National Institute of Standards and Technology (NIST) for use in the thermal/electrical models they are developing to describe performance of PV modules integrated in building structures. In 1998, Sandia personnel also started incorporating the model and the test procedures required for obtaining necessary parameters in the developing IEEE 1479 standard "Recommended Practice for the Evaluation of Photovoltaic Module Energy Production." The equations summarized in Field Experience with a New Performance Characterization Procedure for Photovoltaic Arrays, represent the updated version of the model described in the paper presented at the 2nd World Conference and Exhibition on PV Solar Energy Conversion in July 1998. The updated electrical performance equations provide for irradiance-dependence in temperature coefficients for voltage, incorporate a more physically-based relationship for voltage dependence on solar irradiance, and add the definition and model for a fourth point on the I-V curve. The fourth point (Vx, Ix) is defined at a voltage equal to one-half of the open-circuit voltage. It provides the additional data point required for using the form of the classical single-diode equivalent circuit for a solar cell in calculating additional points on the I-V curve. It is necessary to be able to calculate different operating points on the I-V curve, other than the maximum-power point, when modeling the performance of battery charging systems where the battery voltage may dictate the operating point (Vop) on the I-V curve. A distinct advantage of the Sandia performance model is that the same form of the equations applies equally well for individual cells, individual modules, and large arrays of modules. Many of the parameters in the module database, such as the air mass coefficients and temperature coefficients for current are generic to all models from a given module manufacturer that use the same cell type. The angle-of-incidence coefficients are effectively the same for all flat-plate modules that have a glass front surface. All of us here at MSESC feel fortunate to have the opportunity to include this clearly superior PV performance model into PV-DesignPro. It represents a dramatic improvement over previous modeling methodologies, there simply is nothing better available. On September 1st, 1999 the enhanced series of products will be available, with free updates to purchasers of the Solar Studio Suite v.3.0 CD-ROM between now and September 1st. Maui Solar Energy Software Corporation is committed to continuing in our position as a world market leader in solar photovoltaic, solar thermal, and related design tools and utilities software. Our guarantee is that our products will never be surpassed from a price to value perspective for the consumer. No other provider can produce a portfolio of necessary design tools at a reasonable price similar to ours. We strive to justify our position by making possible the purchase of state-of-the-art design software tools to individuals and organizations that may otherwise be forced to continue using less-than-optimal design methodologies. Because of the costs involved with the competition between solar and fossil-fuel energy sources, erudite systems design made possible by the software will increase the advantages of solar energy worldwide, and clearly delineate the financial impacts of proposed systems. Copyright © 1998-2001 MSESC, Inc.